Lake Champlain is the newest emerging wine region in New York State and, like the Thousand Islands, an area few ever would have suspected would grow grapes and wine. But here they are, working together (the key), organizing a conference, and creating a wine trail. Fifty of New York's 62 counties now have wineries, and that will soon be 51 with a new one in Madison County, home of Assembly Agriculture Committee Chair Bill Magee, a strong champion of our industry. The wine industry is truly a growth industry in more than one way. If you travel north out of New York City and continue well beyond Albany, eventually you'll reach New York State's newest winegrowing region: Lake Champlain. The expansive lake forms the border with Vermont for many miles, while in the opposite direction, to the west, loom the Adirondack Mountains which provide significant benefits to the region's micro-climate by funneling cold weather patterns to either the north or south. Still, it is unmistakenly a (very) cool climate region, and the wine pioneers there seem to be doing everything right. A few years ago, there was one winery, now there are five, with another five or so expected to open by the end of this year. Current wineries include ELFS Farm Winery and Cider Mill, Vesco Ridge Vineyards, Amazing Grace Vineyard and Winery, Stone House Vineyard, and Hid-In-Pines Vineyard. In addition, there are several independent growers without wine production facilities. The Champlain Valley has long been a major apple-producing region, with popular apple wines and hard cider, along with other specialty products like vegetables, fruits, breads, cheeses and meats, making grape wines a logical fit in an area with a strong locavore movement. As with the Thousand Islands region along the St. Lawrence Seaway bordering Canada, the Lake Champlain growers and vintners are wisely focusing on cold-climate "Minnesota" varieties like Frontenac and Marquette which can withstand severely cold temperatures that would damage other types of grapes, especially cold-sensitive Vinifera (European) vines like Chardonnay, Merlot or Riesling. Lake Champlain Wines has organized a winemaking workshop, "Making Quality Wines from Cold Hardy Grapes", on March 11 that will feature Cornell's Chris Gerling (Enology Extension Associate) and Anna Katharine Mansfield (Assistant Professor of Enology), who actually came to New York from the University of Minnesota. On another front, we're working with the group's president, Natalie Peck, to get legislation in place to define a Lake Champlain Wine Trail, hopefully before this year's tourist season gets into full swing. We all know that size matters, and that bigger isn’t always better. This is especially true with breweries and beer. A local case in point is Chatham Brewing, located in a back alley off Main Street in the Village of Chatham, NY. Don’t call it a microbrewery – it’s not big enough – rather, it’s a four year-old “nano-brewery”, diminutive by design, that turns out a proportionately large selection of flavorful, artisanal ales. Home brewing enthusiasts who both worked in bona fide breweries in their twenties, CB owners Tom Crowell and Jake Cunningham, now in their mid-forties, met via their wives and kids in the Chatham area. (A third original partner, Chris Ferrone, is no longer associated). While they both longed to brew on a more professional scale, serious day jobs and family obligations presented major constraints. They had also observed the micro-brew craze in the mid-to-late 1990s—and the ensuing shakeout—and wanted to avoid similar miscalculation. So, to proceed, they needed to find a smaller scale brewing system, and to start out modestly, in test market fashion. Fortune soon smiled on them. Through their home-brewing network, they heard of a bankrupt brew pub in Albany selling off its brewing assets. The system’s capacity—and price—fit the plan. 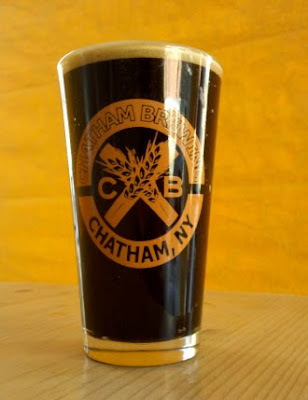 So, with lots of local good will, including professional help to haul the brewing system from Albany, and to establish the refrigeration system in the back alley location, Chatham Brewing hung out its shingle in February 2007. “It’s amazing what people will do for beer,” said Crowell. 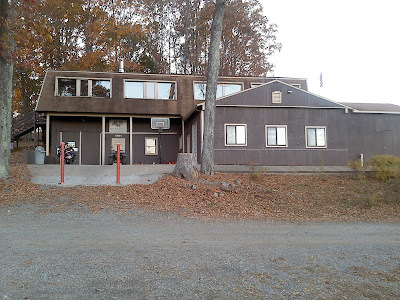 Brotherhood Winery is the oldest continually operating winery in New York state. And of course, it is in the Hudson Valley. The Blanc de Blanc Chardonnay Brut Champagne is a 100% chardonnay sparkling wine. Walking through their cavernous underground cellars, you can see 170 years of continuous winemaking heritage, and you can learn about winemaking, barrel ageing, and their sparkling wine methods. This golden straw colored wine has a wonderful nose of green apple and yeast, with a whiff of toastiness about it. This wine is made from 100% Hudson Valley chardonnay. The wine has lots of tiny, fine bubbles which trail up the flute beautifully. The wine itself was dry and refreshingly crisp. There were big flavors of green apple up front, but a nice, dry finish. Beautifully balanced. An elegant fine sparkling wine. Congrats to Cesar Baeza and winemaker Bob Barrow! Had some friends over for dinner last weekend, and they brought a special gift, Swedish Hill Riesling Cuvee'. 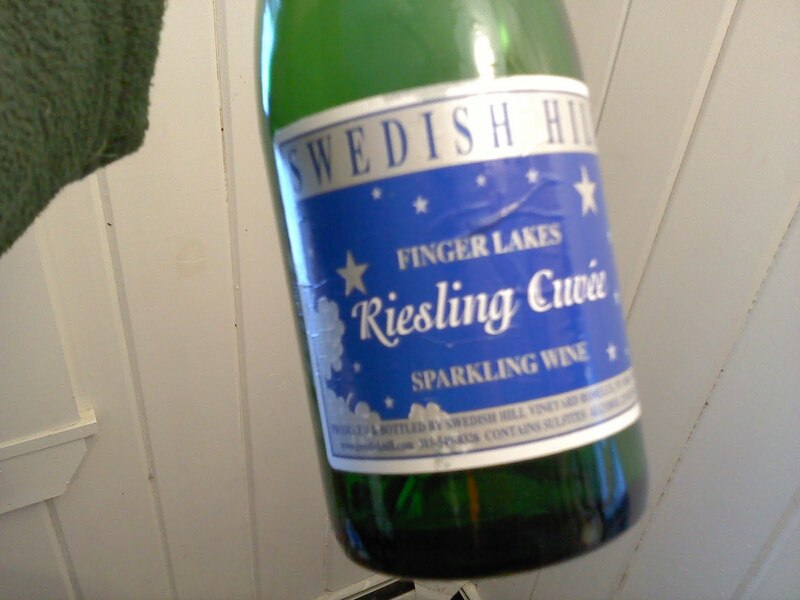 A sparkling riesling. We were very excited by this gift. It's a imited run wine after all. We served the wine with Hudson Red cheese from Twin Maple Farm and crackers, as well as with several types of bruchetta made by the guests. Winemaker Ian Barry's wine was fabulous. There was a burst of green apple and kiwi, as well as a floral note on the nose. And a hint of bread. The apple and kiwi came through, as well as a wonderful finish. It was interesting, because the fruit was big, and added to the mouthfeel, but the finish, between the slight hint of sweetness and the acidity from the fruit, the wine balanced out beautifully. They usually limit purchases of this to one per person, so this is not an esy to find wine. But if you can get your hands on it, it's an absolute winner! The Canadians, those quiet people who live upstairs, perfected the German Eiswine over the last two decades, and made their country almost synonymous with exceptional ice wines the world over. Then someone up there decided to turn apple wine into Eiswine, and they came up with something really impressive. But New England is one of the apple capitals of North America. 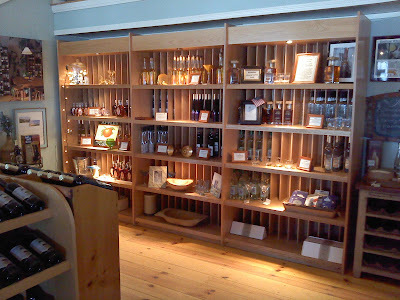 And Still River Winery, in Harvard, Massachusetts has made a very nice ice apple wine called Apfel Eis. The original ice wine perfected by the Germans and Canadians is made from grapes that have remained on the vine past the first frost. When the grapes freeze, the frozen water crystals separate out, resulting in a more concentrated juice – more sugar, more acid, more flavor. Fermentation of this concentrated must produces a deliciously sweet wine. Achieving concentration is labor intensive, and output is relatively low, so ice wines tend to be quite expensive. 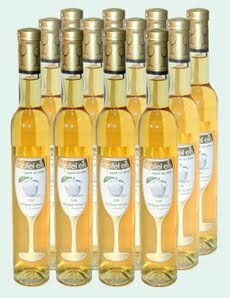 According to Still River, "Apple ice wine was only recently “invented.” In 1990, Christian Barthomeuf, a French winemaker who had emigrated to Quebec, tried substituting the apple for the grape to make what the Quebecois call “cidre de glace” – ice cider. Barthomeuf reasoned that the apple was more at home on Canadian soil than the grape, and would therefore result in a better product." The folks at Still River were inspired by this idea, and created Apfel Eis, an iced apple wine. We were driving from Boston, and decided to stop in at a fantastic wine shop, The Urban Grape in Chestnut Hill, Massachusetts, where the owner introduced us to this wine. 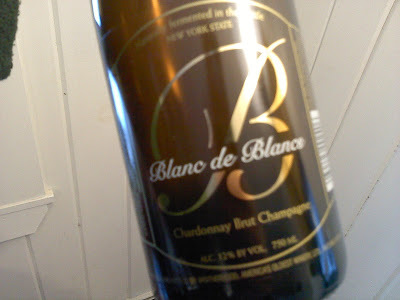 Well, we brought it home, and opened it up the next week at a dinner with Hudson Valley winemakers. Everyone was impressed. nice light version of the wine, with big, big fruit and sugar up front, but not too much, much like a fine Sauternes, and not too viscous, but with lots of acidity and a nice clean finish. A wonderful wine with cheese or fois gras or creme brulee'. 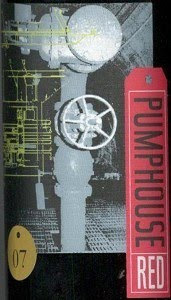 So I was in MacAdams BuyRite on Third Ave near 27th Street, looking for something new to try, when I stumbled upon this new label I'd never seen before - Pumphouse Red. Cool, funky label. From the North Fork, and affordably priced. It was a 2007, which was a very good year, and it had a screw cap top! So I decided to take a shot. Apparently, the wine is made up of 84% Merlot, 9% cabernet Sauvignon, 3% Cabernet Franc, 2% Petit Verdot and 2% Syrah. Very impressive blend. We opened up the wine, and it had big dark fruit on the nose. Blackberry, dark raspberries, deep, dark cherries. There was a whiff of vanilla. The taste was a repeat of what I smelled. Big, dark fruit up front, coupled with great acidity and nice tannins. And a great mouthfeel. The wine went down smooth and had a nice, long lasting finish. This was a wonderful wine. Really enjoyed it. Congrats to PWG! Located in the heart of Massachusetts’ apple country, Nashoba Valley Winery is a stunning hilltop orchard overlooking the charming town of Bolton. They first started producing fruit wines in 1978, and since then have gone to produce fine food wines, beers, and fine spirits. 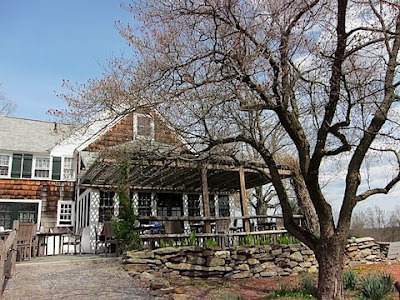 The family-owned orchard and farm, not only boasts all of those, but a restaurant as well. 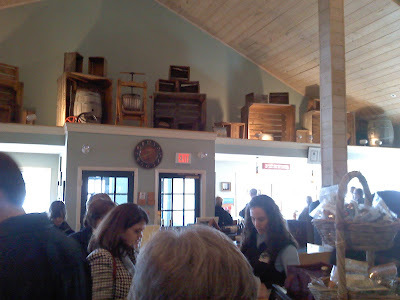 We arrived on a sunny Sunday afternoon, and the tasting room was buzzing. Dominique and I sidled up to the bar only to find out you have to buy your tasting tickets in advance at the cash register across the room, but we were back in a flash with the appropriate tabs. Vidal Blanc is a French-American hybrid grape variety that is as versatile a wine grape as there is. From elegant dry whites to sweet dessert wines, this is a workhorse grape of the northeast. The grapes were whole cluster pressed and the juice is settled overnight. The wine is fermented in stainless steel tanks with Lalvin 71B yeast to accentuate the fruit and reduce the acidity. The wine is aged in stainless steel tanks, cold stabilized, then bottled with about 1% residual reducing sugar. The result is a cold, crisp wine, with lots of fruit up front, and a nice level of acidity. A really clean, zesty white wine. Very refreshing. Very nice. This wine is made with a combination of Massachusetts and Rhode Island chardonnay grapes. The chadonnay grapes are pressed, chilled and cold settled. Clarified juice is inoculated and fermentation is started in stainless tanks, and is then transferred to oak barrels for final fermentation. A secondary, malolactic fermentation is induced giving the wine a creamy texture. Aromas of pear and green apples, with a whiff of vanilla greet you when you first taste the wine. The wine is a light, golden color. The fruit is fresh and clean, and the acidity is well balanced. A nice smooth, creamy finish makes this a delightful chardonnay. This was a light white refreshing wine. Slightly off dry white with a flowery, spicy nose. Hints of honeysuckle, mango, apricot, and white peach. Varietally correct. Very nice. This was a surprise. The first surprise is how much Dominique liked it. It’s a concoction of west coast rhubarb and local strawberries. They press the fruit separately but ferment the must together without settling. The finished wine has 2.75% residual sugar. It’s got a nice big nose of strawberries in white wine, with just enough tartness to make this a refreshing, nicely balanced wine. A very nice fruit wine. Remarkable for a great, fun sipper, and could make a fabulous sangria! This was a deep, deep dark purple wine with a big nose and even deeper flavor. An interesting varietal choice, which is still finding it’s way from the University of Minnesota. One of the better St. Croix I have had. This is a medium-bodied, more Burgundian-styled Cabernet Sauvignon, with a nice garnet color, popping with raspberry and plum, and a touch of smokiness. Lovely in the glass, we savored this a bit, and the wine definitely opened up once it hada chance to expand in the glass. Very nice. 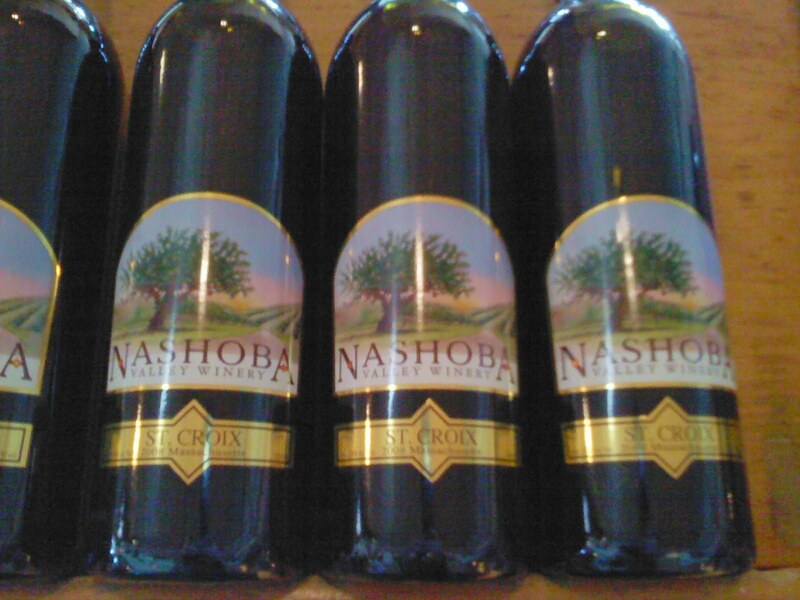 This was easily, hands down, my favorite red wine at Nashoba Valley. Renaissance is their signature blend of oak aged Cabernet Franc, Lemberger and Merlot, aged in American and Eastern European Oak for 12 months. 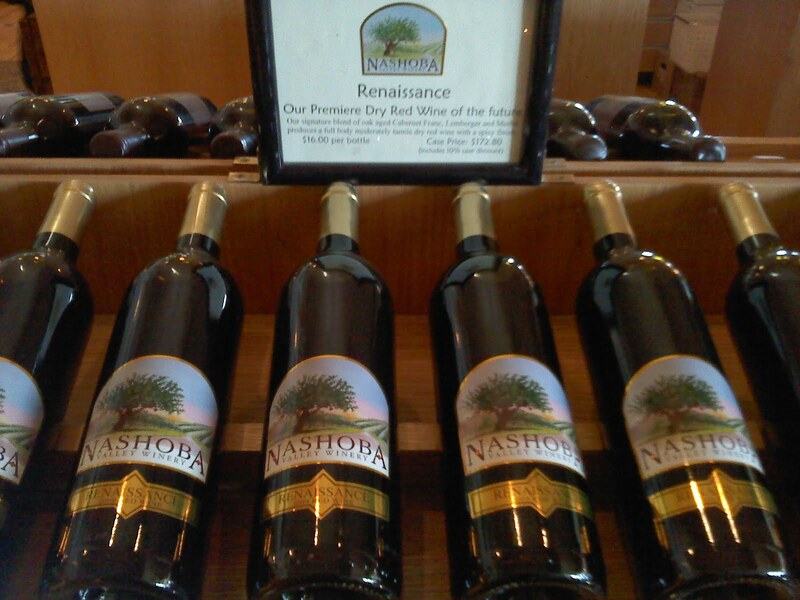 40 % Lemberger, 40% Cabernet Franc & 20% Merlot, Renaissance is the premiere dry red wine of the future for Nashoba Valley – and it’s a great bet. With over an acre of Cabernet Franc and Lemberger planted at the winery, this says great things about what the estate wine might be capable of. Wonderful fruit up front, with hints of violets and raspberries, laced with ripe blackberry and black pepper, and some lovely plum. Nice acidity. Great tannins. Fantastic mouthfeel. If this estate matures as we hope it will, Renaissance will be among the premiere reds of the east coast...not just New England as it is now. Fantatsic! We then tried one of the beers. I let Dominique make the choice. This is an American version of the German Dortmunder Export Style lager. This beer is fermented cold and aged cold to provide a clean and crisp flavor. 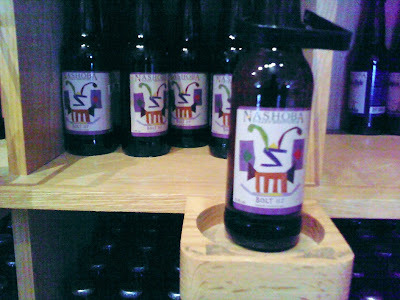 It is hopped with traditional “Noble” hop varieties to provide a subtle spicy hop flavor, complimenting a malty finish. It’s a bright, refreshing beer with great flavor and great finish. Definitely brought home a few bottles of this. 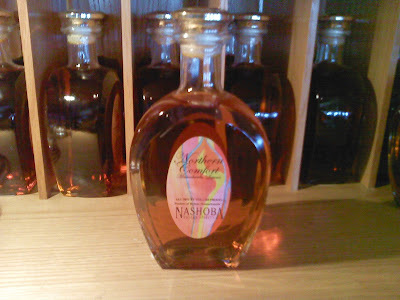 This is Nashoba Valley’s take on cognac. A unique blend of brandy, oak, maple and lemon. It’s a well balanced and complex liquor. I’m not a spirits expert, but many aromas swirl around in the glass - spices and floral notes rise up. A slightly sweet end. Very, very nice. 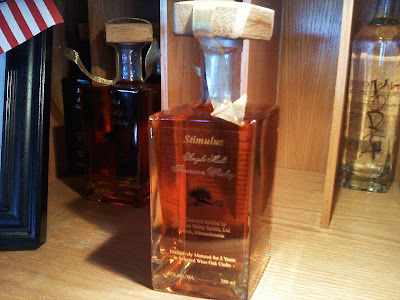 Stimulus is Nashoba’s take on single malt whiskey. This whiskey is 100 percent barley malt oak aged for a minimum of 5 years in new and used oak casks. There’s a slight hint of fruit and generous oak flavors in this big flavored whiskey. This is their very first bottling, which dates back to December 2005. It has the rich golden color and subtle smooth flavors of a fine American Whiskey. 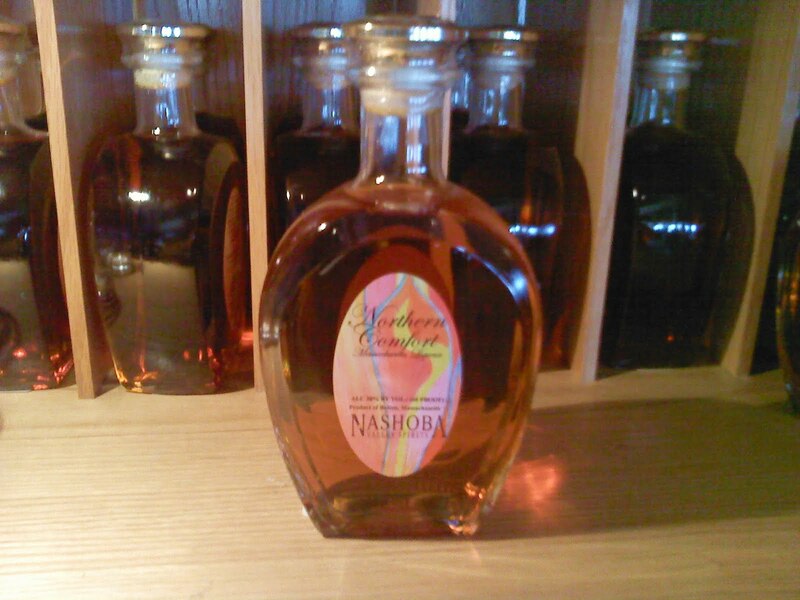 We had a tremendous time at Nashoba Valley Winery and Distillery. 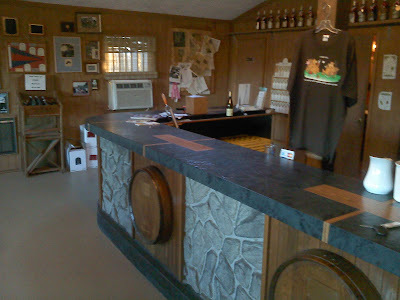 It has grown from a small farm orchard winery to a complex of winery, brewery, and distillery that far out stripped what I remembered it to be from years ago. It is easily one of the biggest and better wineries in the state, that is certainly aiming higher. A great pleasure to go there. A lot of fun. A great stuff to try! 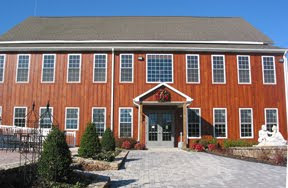 One of the bigger and better wineries of New England. I have to be as honest as I can possibly be. I am not in favor of WIGs in New York. I am angry that more than 3/4's of the state's stores who do not promote New York wine in any meaningful way. I just spoke recently again on this subject. We need more local storesto pick up the flag of local wine. More and more stores are picking this up, but we need more and faster. It's good for tourism, it's good for taxes and revenues, it's good for he land (better to live near a winery than a mall or another development). On the other hand, the NY retailers look like Jennifer Anniston (or Angelina Jolie if you prefer) next to their Jersey brethern. I lived in NJ for 14 years (I still own a house there and pay taxes). The local liquor stores carry virtually no quality local wines at all. None. Period. They are awful! I've even asked several local wine retailers if they would order the wine if I bought it by the case, and they said "No." Only Joe Canal's, Wegmans, and Total Wine carry any at all, and their selections are slim as it iss (but give them kudos). And I know. I visited dozens and dozens of stores in my 14 years, always looking for local wine. So wineries must rely on sales out of their tastingroom, and wine clubs to dedicated customers. Now the Retailer's Alliance (of New Jersey) is coming down on the state wineries who want to ship direct, within state, to wine club members and the like. They are trying to rescind the winery laws, while also trying to keep California wineries out as well. "Nope," say these thuggish retailers, "If you don't want our hand picked selection, then you can't have any other." More importantly, like the Sopranos, the wholsalers and the wine store owners want a piece of the action on everything sold in the state. It's preposterous. You don't get residuals on products you don't order, stock, or sell. Whatever happened to free trade. Aparently it happens in China, Mexico, and India. But not in New Jersey. Quite frankly, these 39 New Jersey wineries are getting the proverbial shaft. The law makers in New Jersey are going to kill a vibrant, if small wine industry in the Garden State, if they don;t act quickly. This is a dangerous piece of law, and it must be countered immediately. If this kind of law succeeds, other states will adopt it (are New York and Virginia next?) it will cripple the entire industry nation wide. Only California, Washington, and Oregon have industries vibrant enough to spend significant amounts of money to defeat special lobbies such as this. This will affect us all. Here's two good articles on the subject. The essay at the botom is better constructed, but no less angry then mine. The state lets customers buy directly only from them. An appellate panel has sent foes of the law back to a U.S. judge. A recent federal court decision could sink two New Jersey battleships. That would be Battleship Red and Battleship White, boutique wines made by a Salem County winery in honor of the USS New Jersey. Small winemakers, such as Auburn Road Vineyard & Winery, which makes the Battleship label, feel endangered by a ruling that overturned a state law giving special sales privileges to New Jersey wineries. In December, a three-judge panel of the U.S. Court of Appeals for the Third Circuit ruled that New Jersey unconstitutionally discriminates against out-of-state wineries by permitting only in-state wineries to sell directly to consumers and retailers. The appeals court sent the case back to a lower court with two options: Give out-of-state wineries the same right, or prohibit all wineries from selling directly to consumers. New Jersey's 39 wineries, many of them with roots in the sandy soil of South Jersey, fear the court will make the second choice. "If that happens, the wine industry in New Jersey will cease to exist," said Scott Donnini, a Philadelphia lawyer-turned-vintner who is one of the owners of Auburn Road, near Woodstown. "Without the sales in our tasting rooms - 90 percent of our sales come from our tasting rooms - we'd be toast right away." Donnini and the other members of the Garden State Wine Growers Association have hired Sills, Cummis & Gross P.C., a law firm in Newark, N.J., to intervene in the case and argue for allowing sales by all wineries. That could put them in conflict with liquor retailers, distributors, and the state Division of Alcoholic Beverage Control, which want to maintain the state's "three-tier" system of selling wine. The ruling also could reignite legislative efforts to legalize direct shipping of wine to New Jersey residents. Currently, in-state and out-of-state wineries cannot ship directly to consumers. The state Senate last year passed a bill that would permit direct shipping, as 37 states do, but the measure has languished in the Assembly. "This court decision is going to help accelerate the conversation that something has to change," said Assemblyman John Burzichelli (D., Gloucester), sponsor of the Assembly bill (A.B. 1702). "Allowing direct shipping would help answer what the court is talking about." Burzichelli, who chairs the Regulatory Oversight and Gaming Committee, where the bill resides, said he hoped to move the measure to a vote soon. Sal Turdo is an electrical contractor up in Bergen County. That's his bring home the money job. But that's not his passion. Wine is. Sip some wine with him on an August afternoon on the patio outside at his North Cape May vineyard and you soon find that out. He'll tell you about his boyhood days in Italy and the summers he spent helping his family nurture the grapes and then make the wine. He packed that intense enthusiasm with him when he came to America but it wasn't' until a decade ago when he bought five acres in Cape May that he was able to once again to indulge his love of wine. Now he, his wife, Sara, and his son, Luca, run a winery that makes some dam good wine. 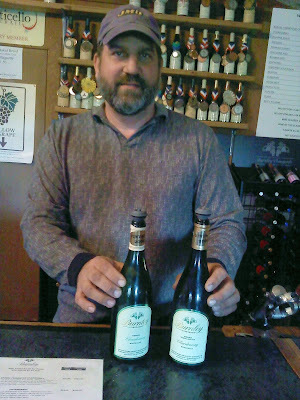 Sal is one of 34 winemakers in New Jersey. By and large these are mom-and-pop operations run by people who, like Sal, are passionate about wine. I suppose they all make some money — but not much. All they want to do is make wine and share it with others. But now that's being threatened. A federal appeals court gavel is about to crush their dreams and rob them of their passion unless the guys in Trenton act — and soon. Here's why: New Jersey has a law that prohibits out-of-state wineries from shipping directly to customers. The law, however, does allow local guys to sell bottles at their wineries and to pour tastings. Sort of like farmers selling their crops from roadside farm stands. But a federal appeals court in Philadelphia says that's a no-no. It violates the commerce clause of the Constitution, the court says, because it treats in-state and out-of-sate wineries differently. The fix is simple but then again nothing is simple in Trenton and nothing gets done with any speed. More about that in a minute. Now I suppose wine snobs are smirking, wondering why anybody would be fighting for New Jersey wines. After all, aren't they syrupy fruit wines that are hard to get down? There are those out there but there also is some very fine winemaking going on in New Jersey and it's happening from Sussex to Cape May. 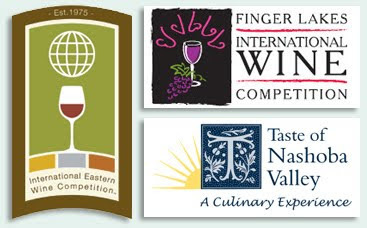 The wines are wining competitions in places like San Francisco and the Finger Lakes of New York. 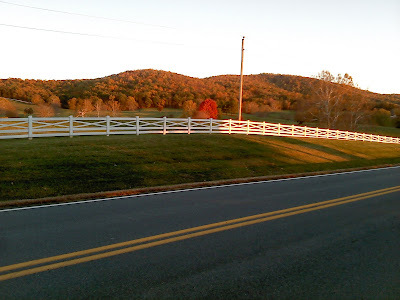 Kluge was one of the most high profile wineries in Virginia, and certainly on the east coast. 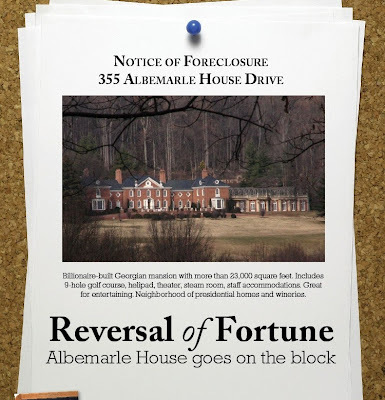 Their descent into the shuttering of the great wine estate and the foreclosure of the grand Albemarle House is a sad debacle, written about exceedingly well by Lisa Provence. 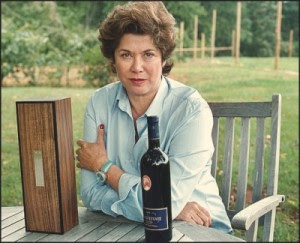 For former billionaire's wife Patricia Kluge, the auctions, the lawsuits, and the loss of the winery bearing her name combined to make 2010 seem to be a very bad year, an annus horribilis as the Queen of England once quipped. Unfortunately for Kluge, 2011 may be worse. Last year, Kluge put her jewelry, furnishings, and even her clothes up for auction in a bid to stave off creditors. 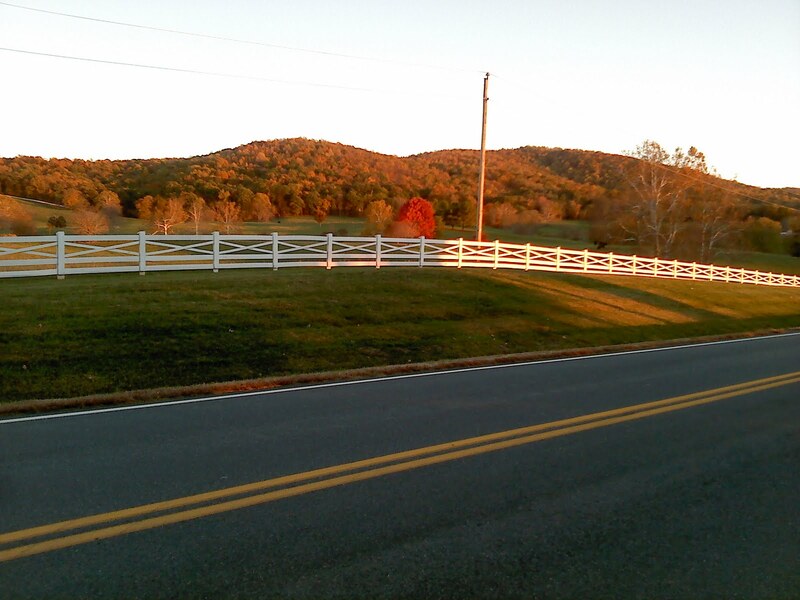 Yet in December, she and her husband, a one-time state wine leader, lost their 960-acre winery to foreclosure, crushing the couple’s dream of bringing high-quality Virginia wine to the national market. Now, another auction looms. Albemarle House, the mansion where Patricia Kluge once entertained kings, princes, and U.S. presidents in haute grandeur, has been foreclosed upon. "That house was built at a time when an inkling of that style existed," says architect David Easton, who designed Albemarle House. "The issue in this day and age: It is not 1900." 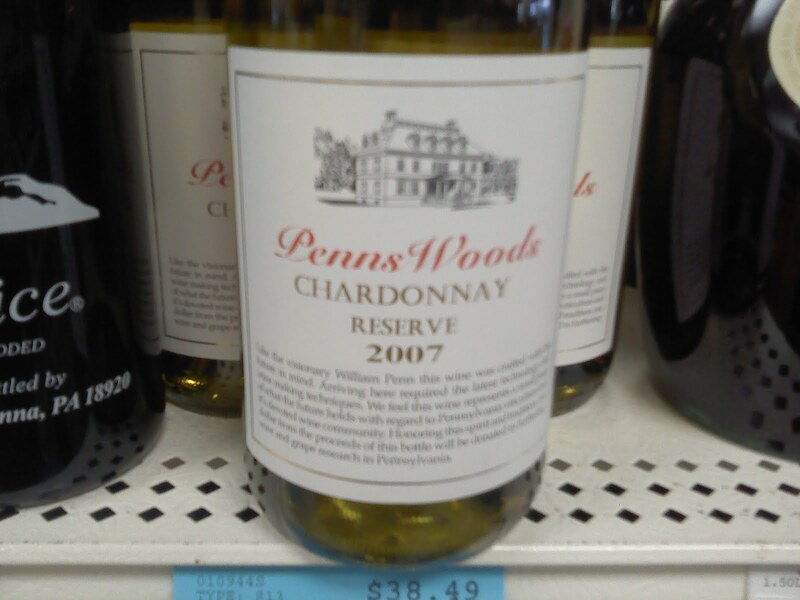 Paul Vigna reported, of Penn Live and The Wine Classroom wrote, "Owner/winemaker Gino Razzi and Penns Woods Winery got a nice bump from a couple of tasting videos, including one with Vino Vic and a much longer spot with the celebrated Gary Vaynerchuk of Wine Library TV. Vaynerchuk and Jason Malumud, a member of the Penns Woods family, occupy the camera for almost 25 minutes talking about Pennsylvania wines and, more specifically, Razzi's winery. Vaynerchuk loved the 2005 Merlot Reserve that Malumud brought along. Even the Brandywine Valley Wine Trail, which Penns Woods belongs to, got a mention." Paul Vigna is a solid sports reporter and wine blogger. I'm expecting to see a number of releases from regional wine trails over the next couple weeks touting their activities for 2011. 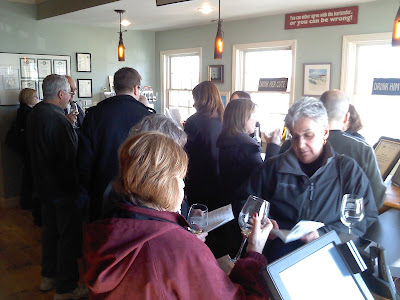 As one Pennsylvania winery owner told me last week, the wine trails have become the primary source of publicity generated for wineries in the state. That lack of a state push, due to funding, is what separates Pennsylvania from Eastern states such as New York and Virginia. Thanks to Tracey Werner of Blabbermouth Communications in Easton, Pa., here's information on what the Lehigh Valley Wine Trail is planning. 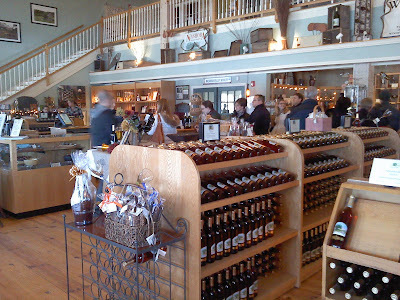 The nine family-owned wineries of the Lehigh Valley Wine Trail have announced their 2011 schedule of special events. Wine in Bloom – May 21 & 22 – This first-time event replaces last year's AVA Weekend. It takes place mid-Spring as bud break occurs on the vines. It still celebrates the importance that terroir (soil) plays in the development of the grapes, their flavor and the resulting taste of the wine, and stresses the importance of the A.V.A. designation in further legitimizing the area for wine making. Wine on the Mountain – July 23 & 24 - Held at Penn's Peak in Jim Thorpe, this event includes wine samplings, local artisans displaying their arts and crafts, light fare available for purchase, and live entertainment. Tickets are required for this event and can be purchased at each winery as well as at the door. Harvest Weekend – The Butcher, The Baker and The Winemaker – September 10 & 11 –The wineries proudly promote the state's "Pennsylvania Preferred" program by partnering with manufacturers of other Pennsylvania products to showcase their high level of quality. Wine pairings, vineyard tours, food, music and other special activities are featured. Chambourcin Weekend – October 15 & 16 - Taking place after the harvest is over, this event celebrates the "official wine grape of the Lehigh Valley," the Chambourcin. Nouveau Weekend – November 19 & 20 - This is the earliest chance to sample the first vintages of the new harvest. It's also a great opportunity to purchase wines for the upcoming holiday season to give as gifts or to drink at dinner. March Madness passports also go on sale this weekend. CLOVERDALE, Calif. - The hottest emerging wine region in the country was getting a lot of buzz at the largest American wine competition here last month: Paso Robles. The massive wine region between San Francisco and Los Angeles, known for its lusty Rhône-style reds and zinfandel, recently took half the top awards at the 2011 San Francisco Chronicle Wine Competition: a Thacher 2008 Triumvirate zin and a 2008 Lock Vineyard cabernet from Ecluse shared best red. A 2009 late harvest sauvignon blanc from Alapay took best sweet. There were also kudos for bottles from up-and-coming regions such as Washington and New Mexico. Under the radar, perhaps, but of equal interest to me, one of the competition's few East Coast judges, were surprising successes from the cranberry bogs of South Jersey, the slate-rich slopes of the Pennsylvania Alleghenies, and the searing-hot jalapeño pots of North Wales. At Linganore Winecellars and Berrywine Plantations, wind turbines power the tasting room refrigerators, the rattle of the bottling line, and when summer festivals come around, they'll power the music too. But the windmills lighting up the winery since Feb. 1 aren't spinning away on the Mount Airy property. Instead, they're part of a turbine farm far away made accessible through a green energy company Clean Currents, a Rockville-based company that allows customers to buy clean energy credits to neutralize their power usage. A new power source has been on the mind of the winery's president and winemaker Anthony Aellen for a long time, he said. For 25 years, the winery has maintained a recycling program with its pulp and even donated byproducts of the winemaking process to help make nontoxic children's modeling clay for local nursery schools. And an integrated pest-management system has cut down on spraying in the vineyard, but Aellen was still seeking out more ways to be a steward to the land. Aellen said he had investigated solar power about eight years ago, but the upfront cost was too much. The panels cost $50,000 each, and what he would need topped at $800,000 for one-third of the winery's power. So he turned to wind energy two years ago, and was disappointed by some initial research. "I found out that we really don't live in a very strong wind environment," he said. But then he got some calls and realized wind energy was a possibility without a line of turbines on his farm or changing any wiring. Clarke School for Hearing and Speech / New York is pleased to announce plans for a uniquely entertaining evening to benefit the school. Riedel Crystal and Shaw Vineyard will conduct a lively tutorial on the perfect pairing of wine and glass amid the vibrant paintings of one of America’s pre-eminent artists, Larry Poons. Guests will have the added pleasure of an insider’s overview of the artist and his work presented by Renato Danese, an art historian and the owner of the gallery. The event will be held on Wednesday, February 16, 2011 at Danese, 535 West 24th Street (between 10th and 11th Avenues) from 6:00 PM until 8:00 PM. Seating is limited so fill out the form below to reserve your spot! Tickets are $150 per person. Price includes a set of Riedel tasting glasses (one each of Cabernet, Pinot Noir, Sauvignon Blanc, and Montrachet; a $100-plus value), wine and light appetizers. All proceeds from the event will be used to support Clarke School for Hearing and Speech / New York. Clarke Schools for Hearing and Speech provide children who are deaf or hard of hearing with the listening, learning and spoken language skills they need to succeed. Annually, more than 800 children and their families benefit from programs and services at our five campus locations: Boston, Jacksonville, New York City, Northampton and Philadelphia. To request more information about the event or Clarke School for Hearing and Speech / New York, please contact Christina Danese, Development Associate at cdanese@clarkeschools.org or 212-585-3500. Riedel Crystal of America – "The finest glasses for both technical and hedonistic purposes are those made by Riedel. The effect of these glasses on fine wine is profound. I cannot emphasize enough what a difference they make." (Robert M. Parker, Jr., The Wine Advocate). 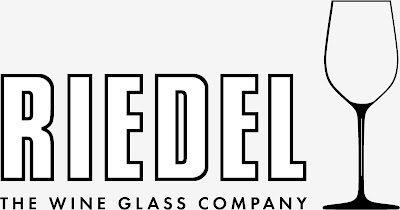 For detailed information about Riedel’s glass creations and their unique philosophies on the ultimate enjoyment of wine, please visit our website. 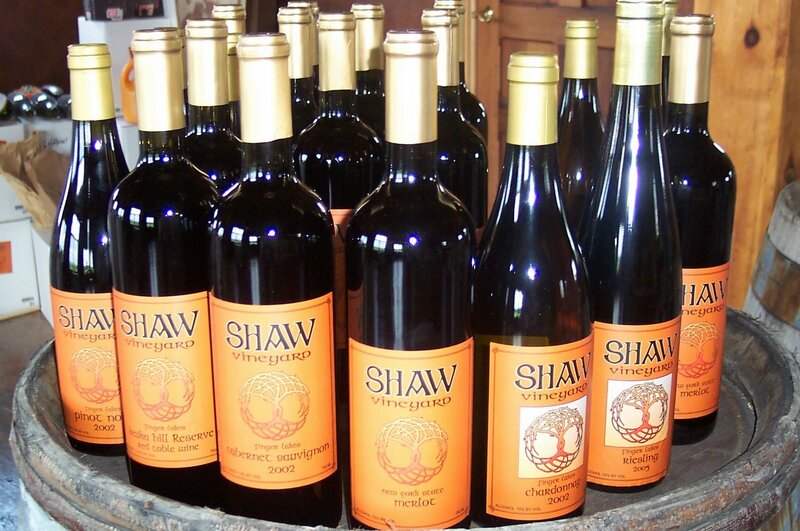 Shaw Vineyard - Shaw Vineyard is dedicated to the production of vinifera wines in a dry, cool-climate style reminiscent of the great European producers. Winemaker Steve Shaw employs careful and in some cases unique methods in his production facility, resulting in wines that exhibit complexity and full flavors. Danese - Danese opened in New York in 1997 with concurrent exhibitions – Dan Flavin's iconic sculptures 'Monuments' to V. Tatlin, and rare drawings by Kazimir Malevich. Since then, the gallery has built a successful international reputation with a focus on the representation of contemporary artists and estates. Sfogila Restaurant - Sfoglia materialized quietly in an inauspicious space where a parade of restaurants had tumbled, its whimsical country-cottage airs instantly disarming, its borrowings from Renaissance cookbooks both daring and delicious. (Gael Greene, New York Magazine). 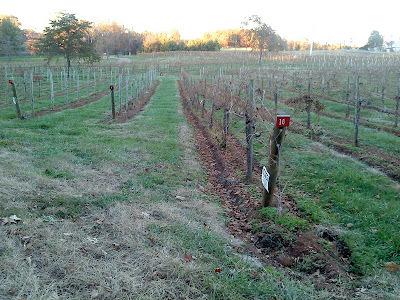 Burnley Vineyards is amongst the oldest planted vineyards in Virgina. Retired Army Col. C. J. Reeder and his family planted them back in 1977. Reeder's last assignment in the army landed him in Charlottesville, where he decided to literally sink his roots. Today, the winery is run by son Lee and daughter-in-law Dawn. I met them while I was traveling Virginia back just before Thanksgiving, so this post is late in coming. The extensive vineyards that rise up and down along the sides of the undulating are opposite the unpresuming winery and tastingroom. They are indeed beautiful. Upon entering the tastingroom, which is loaded with medals and awards for thier years of winemaking, I was greeted by Lee and Cooper. Cooper was interested and affectionate - not bad characteristics for an enormous German Shepherd. Cooper is of a literary bent, having appeared in Winery Dogs: USA. Lee is friendly and chatty. I tasted several of his wines, before Dawn came in. Both met in college. They were friendly and easy going folks. Really nice people. Chardonnay - The first one I tried was a stianless steel Chardonnay, full of tropical fruits, big green big apples, and an almost cirtus finish. Very nice. Fresh and fun. A refreshing white, with a lemony dry finish. Barrel Fermented Chardonnay - Normally I am not a barrel fermented (the wine was stirred every two weeks), barrel-aged white guy. But here, I have to say, I was pleasantly surpirsed. The wine had rich honey and apple notes - a whiff of melon? Lots of green apple. And a pop of vanilla from the oak. Buttery touch to it, but not over oaked like some can be. The trick here was the wine had lots of fruit and acidity, so it stood up to all the manuipulation. A big, white wine - a nice surprise. 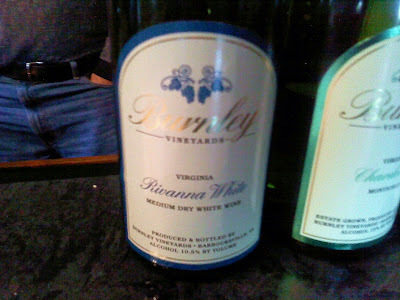 Rivanna White 20009 - This was a Germanic-styled, fresh, off-dry white wine made with Vidal Blanc. grapes crafted in a Germanic style. The result is a nose with lots of lush, tropical fruits, again, with nice acidity to balance out the fruit and hint of sweetness. A lovely wine. Refreshing. A great sipping wine. One can easilly serve this to guests, especially during Super Bowl parties, during a BBQ, or during any evening gathered round the fireplace or patio. Norton 2008 - Norton is one of the most highly publicized grapes in Virginia. This full-bodied, dark red-purple wine is rich and powerful. I enjoyed this immensely. Lots of fruit up front, with a big pop of acidity and medium tannins, to help bring across the big flavor without the fruit overwhelming everything. A great wine with beef, pork, chicken, or game meats. Rubix 2007 - This was among my favorite ports that I tasted during my trip through Virginia. It's made from Norton grapes of course. A big, deep, full bodied dessert wine that is big on fruit, yet soft, rich, and complex. A dark, rich elixir. Burnley Vineyards was an excellent visit!